They visit Miss Temple’s room, and she promises Jane absolution if she discovers Mr. Brocklehurst’s comments to be unjust, then gives the girls a sumptuous feast of tea, toast and seedcake. The conversation between Helen and Miss Temple is at once informative, as well as profound. Although the next morning Helen is made to wear the word “Slattern” around her neck for keeping messy drawers, she accepts the punishment, although Jane is indignant. 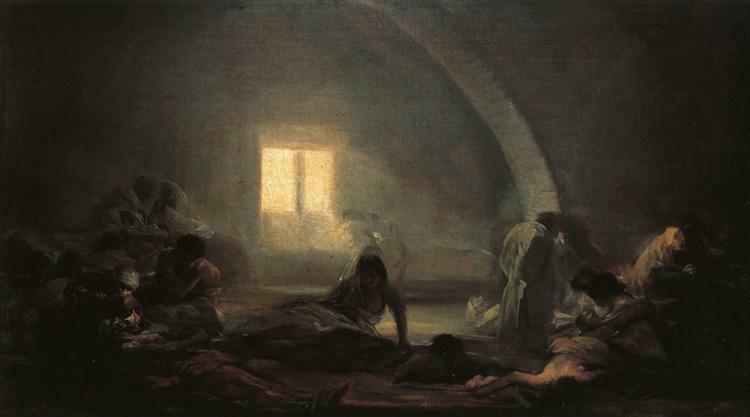 Miss Temple indeed absolves Jane of the accusations, and our heroine is beginning to learn that ‘Better is a dinner of herbs where love is, than a stalled ox and hatred therewith.’ The hardships faced at Lowood among people who care about her are like gold, whereas the luxuries of Gateshead are like dross. As spring arrives, some of the privations of the previous months are lessened and Jane begins to wander further than the walls of Lowood into the natural beauty of the forest-dell. But the fog that surrounded the area brought typhus with it, and especially because of their lack of nutrition and physical weakness, many of the students succumb to the pestilence. Jane is left with the other healthy students to ramble around the environs, as the teachers are busy dealing with the sick pupils. But while Helen is absent, Jane does not realize that her illness is critical until she hears from one of the teachers that Helen’s life will soon be over. Visiting Helen in her sick-bed, her friend imparts more words of her gentle wisdom before succumbing to the consumption that the reader had seen glimmers of since her first introduction. 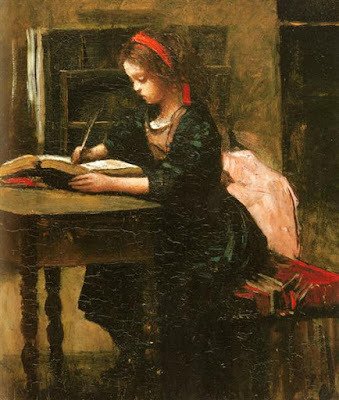 With the Reeds cruelty and no other connections other than Bessie, Jane receives her religious instruction from this angelic girl who seems to have a wisdom from beyond the world. The story is put in fast forward. The disease at the school brings the attention of the public and an examination is held, which finds the conditions deplorable and positive changes are made. Jane continued 8 years there as a student and two as a teacher, but when Mrs. Temple marries and departs, a wanderlust seizes Jane and she applies for a position of governess at Thornfield Hall. Bessie arrives to reveal the scandals at Gateshead: Georgianna’s attempt to run away with a Lord was prevented by her sister, Eliza, and John is living a debauched life of drink and women. 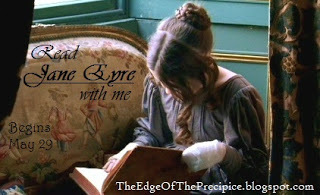 Her uncle, John Eyre, arrived, looking for Jane, but left for parts unknown. 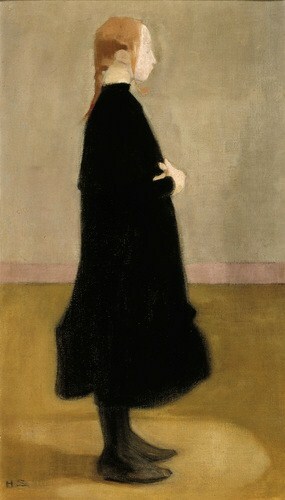 And so Jane leaves for Thornfield Hall. I don’t have much insight to add to these chapters. We observe the development of Jane’s character in a positive way, which exemplifies the fluctuations in life and circumstance and enforces that adversity and hardship can be good for building inner strength of character, depending on how we choose to face it. Yikes, I’ve fallen behind in the pace with my busy non-book schedule, so I need to catch up. Wish me luck —– I’ll need lots of it!!! 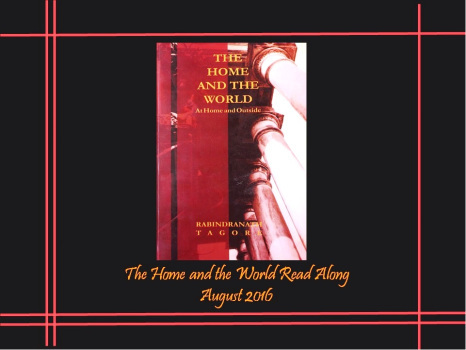 Cirtnecce from Mockingbirds, Looking Glasses and Prejudices is hosting a read-along this August of The Home and the World, a novel that explores early 20th century India and the contrast between new ideas and old, a clash between tradition and progress. For this work, the author, Rabindranath Tagore, became the first Non-European Nobel Prize winner. Not to mention it’s the 100th anniversary since the novel’s publication date in 1916, so what better time to read it! I know so little about Indian history that I’m very excited to be adding to my small fount of knowledge. Cirtnecce, with her vast knowledge of her country, will be guiding us through, not only the book, but the peripheral issues such as the political background of the time and the role of women in society. It’s going to be an excellent read-along …. I can already tell. So please join us beginning August 1st! Well, the 2016 World Softball Championships are now over. Some of the events were wonderful and inspiring, and some rather anti-climatic, but no one can ignore the passion and interest in this sport from the 31 participating teams from all over the world. Not only did Australia, ranked 3rd in the world, get knocked out of the top contenders, they didn’t even win their lower pool, being beating by Puerto Rico, 4-0. They did not look like the same team that has been to the Canadian Open in previous years. It was rather disappointing. 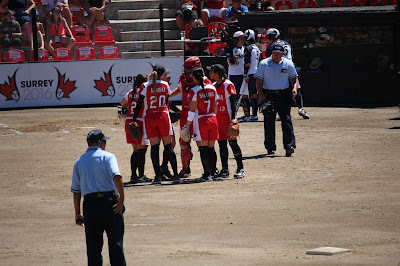 I was scorekeeping on another diamond for the bronze medal game, but apparently the Canada vs. Japan game was an embarrassment. Canada couldn’t hit and the Japanese kept cranking home runs off all of our pitchers. Even Sara Groenewegen, who has been our secret weapon, was unsuccessful. They mercied us. Again, embarrassing …… This was Canada’s highest place showing at an Open, so it wasn’t a complete disaster. The U.S. ended up with Gold, getting two three-run home runs off the Japanese pitcher, Yukani Hamamuro, before she was changed out for Yamato Fujita, who allowed no runs. It was too late, as the U.S. won the game 7-3. It’s the first time I’ve been to the Canadian Open (which this year was the World Championship) where Japan hasn’t won Gold. It was a very weird feeling. I must admit Japan is my favourite team. One of my favourite players is Eri Yamada, their centre-fielder. She’s not quite as crazy and hyper as she used to be, but she still gives a great show. Here’s a story of Uganda’s journey to the World Championship. And more random acts of kindness: there is an article that talks about a Vancouver businessman who took out the Indian team and bought them all cleats. It’s wonderful to hear uplifting stories like these. And so, it’s all over. I miss going out every day to score, but honestly I’m exhausted. And I must get back into my reading-grove. I hope I can. It’s been awhile and I’m only one book ahead on Goodreads now, whereas before I used to be 8 books ahead. For shame! The first book to finish off will be A Doll’s House which I was reading with Cirtnece, and then at the beginning of August I’m starting her read-along of The Home and the World; nothing like events to start me reading again. I’m looking forward to it! Tomorrow is the last day of the tournament and it’s been quite an experience. I’ve really enjoyed meeting some of the athletes, making friends with some of the other volunteers, and enjoying the ball games. The weakest teams are Kenya, Uganda, Ireland, Israel, Austria, Switzerland, Serbia and India. I’m assuming that these teams don’t have softball programs. The Austrians told me that they have about 7 teams throughout all of Austria and have to travel to play each other. Bravo to all of them for putting these teams together and for being brave enough to come and face some of the top guns! I’m sure it’s quite an experience for them. I scored the Greece vs. Peru game today and what a great game! The local coach who previously brought Venezuela up to par, was working with the Greek athletes and boy, they made some amazing plays. They won 4-0. The Aussies are complete nut cases! They, by far, win the award for the loudest cheering and the happiest drunk people. Yellow and green everywhere they go! Sadly, in spite of being ranked third in the world, they were knocked out of the top contenders and have had to settle for the consolation round. The Irish team decided not to take expat Irish players from U.S. colleges and showed up with an all Irish team of mostly Slo-Pitch players. It explains why they are one of the weaker teams, but it’s been exciting to see all these teams improve over the tournament. Canada plays Japan tomorrow for Bronze and the U.S. will face the winner to play for Gold and Silver. Japan lost tonight to the U.S. 4-3. It was a weird game. Usually Japan has played a short game, hitting beautiful singles to the outfield and running like the wind to get runs. New male coaches have replaced the usual female ones this year, and they seem to be hitting for home runs. Sometimes they get them, but often they get out. I’ve never seen this strategy from Japan before. However, Japan usually saves all they have until the final games and then turns it on, making you realize how good they really are. There was an absolutely amazing throw-out at home plate from right field by the Japanese tonight. I don’t think any other team could have made such a perfect throw. They really are the team to beat. The World Softball Championships continue and the games are beginning to get better since the teams were pooled after the third day. No more 28-0 blow-outs, which was a relief. It was so agonizing to see Kenya completely annihilated by New Zealand, not being able to even touch the ball. The stronger international teams usually have expats who play in U.S. colleges, so their level of skill is excellent. Some local coaches continue to practice with the weaker teams such as Kenya and Uganda, and it’s very encouraging to see their quick improvement. These teams celebrate the smaller goals, like getting a few runs in a game, or making more intricate plays. Two Cuban players were found missing a couple of days ago and it appears like they’ve defected. I suppose incidents like this can happen at any large sporting event. Canada lost in an embarrassing 7-1 game versus Venezuela. Venezuela used to be a very weak team, but a local coach took over their training a couple of years ago and since then, they’ve become a contender. Nevertheless, a very lacklustre performance by the Canadians. They seem to do this every year, except for one, when their head coach was off and the assistant coach took over. Hmmm …… In any case, they beat Puerto Rico last night 10-0, so in a way, they redeemed themselves. The Israeli team has come complete with bodyguards. Before each game, dogs scour the park for anything suspicious. It’s quite a serious business, and rightly so since the horrible incident at the 1972 Summer Olympics. I scored the Israel game yesterday and we had a very muscular, tattooed, imposing bodyguard enter the booth and ask very gruffly why the game had been moved from one diamond to another. We had to explain that Pakistan hadn’t arrived and as their game had been cancelled, this one was moved to the better diamond. He grunted and left. And so the tournament contines ……..
AWOL ~ Here’s Why …………. Softball Anyone ….. ??? I have been absent from my blog for some time and rather than remain completely silent from my lack of reading, I thought I’d explain the reason for my truancy. The World Softball Championships are being held in Surrey, B.C. from July 15th to 24th, and I was moved up to the top tier of scorekeeping, scoring the international teams (as opposed to the minor teams, which usually are from Canada and the Western U.S., which I’d previously scored). So, in addition to being freaked out by my new role, I’ve been roaming parks, scoring ball games for practice and attending a few meetings. The Championships began this past Friday. 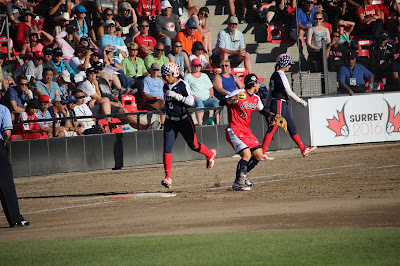 Softball enthusiasts are attempting to get softball (and I believe baseball as well) back into the Olympics, so this is a very important tournament to showcase the sport and prove that it is an international sport and not just a national one. There are 31 countries participating, so I think just by the turn-out that they’ve proved there is an enormous amount of interest in softball, which is also often called “fastpitch”. So I thought I’d post some updates if I have time, because, as usual, when people and countries come together, there are very interesting stories to be shared. Yesterday my first game was cancelled because Pakistan’s visas were lost in transit from Dubai, so they are stuck and cannot be let into the country without them. They’re hoping to arrive on Monday, but we’ll see. Kenya arrived with little equipment and only running shoes to wear. In their game with New Zealand, their pitcher was injured because they didn’t have cleats, so after that game, New Zealand bought them all new cleats, and someone else bought them new equipment. There are about 10 teams who came with no place to stay who are housed in a high school nearby. They sleep on cots. Team Uganda played against one of our minor U18 teams, who introduced them to the SnapChat face-swap and they went nuts for it. They had a grand time giving themselves dog faces, face swaps, etc. and in return, Uganda taught the U18s how to dance. It’s been a great start to the tournament, and after today, the teams get pooled according to their placement in the first three days. Usually Japan walks away with gold, but we’ll have to see. They almost lost to Venezuela last night, so one never knows.